Born: March 1, 1953, in Oak Ridge, Tennessee. Family: Son of William K. (Oak Ridge National Laboratory scientist) and Viola (business manager of the Children's Museum of Oak Ridge, Tennessee; maiden name unknown); married Cantey (cofounder of Echostar; maiden name unknown); children: five. Career: Frito-Lay, 1976–1978, financial analyst (certified public accountant); EchoStar Communications Corporation (formerly EchoSphere), 1980–, chairman and CEO. Awards: Star Award, Home Satellite TV Association, 1988; Master Entrepreneur of the Year for the Rocky Mountain region, INC. , 1991; Space Industry Business Man of the Year, Aviation Week , 2000; CEO of the Year for the Satellite Industry, Frost & Sullivan, 2001; 400 Richest Americans, Forbes 1998 and 2001. Address: 5701 South Santa Fe Drive, Littleton, Colorado 80120; http://www.dishnetwork.com/. ■ Charles W. ("Charlie") Ergen is somewhat of a legend in the satellite business. A onetime professional gambler, he launched the EchoStar Communications Corporation with practically nothing, bet large, played for high stakes, and became a major figure in the television communications industry. Chairman and CEO Ergen developed the company's DTH products and services, which included direct broadcast satellite (DBS) television dishes, integrated receivers and descramblers, programming, installation, and third-party consumer financing for the company's products and services. In the early 2000s EchoStar operated nine U.S. distribution centers that served an independent network of DTH retailers, distributors, and consumer electronics outlets. EchoStar also partnered with Microsoft Corporation to provide WebTV access though EchoStar's DBS system. Ergen first glimpsed a satellite when his father took him out to a field near their home to watch Sputnik, the pioneering Russian satellite, pass overhead in the autumn of 1957. After graduation from business school in 1976 Ergen became a certified public accountant for the snack maker Frito-Lay. He left Frito-Lay in 1978 to spend time investing in the stock market, hoping that he would later go into business for himself. In 1980 Ergen and Jim DeFranco, a gambling buddy, tried their luck at the blackjack and poker tables in Las Vegas, Nevada—they were both considered professional gamblers at the time. Both men were ejected from the town after being accused of counting cards at blackjack; while looking for something else to do, they saw a truck carrying a huge satellite-television dish. Like shrewd card players attracted to games of risk, they impulsively decided to jump into the new business of satellite television. Ergen, DeFranco, and Ergen's future wife, Cantey, pooled their savings of $60,000 and started their company. They bought two satellite dishes and set out in a truck to drive one of the dishes to Colorado, judging that the mountainous state with its poor TV reception was an obvious market for satellite television. Unfortunately, a strong wind blew the trailer off a highway, destroying the equipment, but the one functioning satellite dish they still owned was all they needed to display their wares. Operating on a shoestring budget, they drove around small towns and rural areas in the Denver area selling full-size satellite dishes from the back of their truck. The company prospered by keeping up with the rapid technological changes in the industry and offering new services as soon as they were available. In 1990 Ergen brought EchoStar into the small-dish satellite business by raising $335 million in junk bonds, buying orbital slots for satellites, and going head to head with his much larger competitors. In 1992 the Federal Communications Commission granted EchoStar a DBS license and assigned the company its own satellite orbit. In November 1994 Ergen began construction on his DISH Network's first uplink center in Cheyenne, Wyoming, and on December 28, 1995, he directed the launching of the company's first satellite, EchoStar I, from Xichang, China. That allowed EchoStar to provide its own DBS service, which began three months later, and in another three months the network was serving served 100,000 subscribers and had become the fastest-growing DBS television service. Ergen's expanding company opened a second customer service center and sent a second satellite into orbit later the same year. Following Ergen's successful launch of the company's third high-power satellite, EchoStar III (this one from Cape Canaveral, Florida), on October 5, 1997, the company signed up its millionth customer. In 1998 Ergen sued Rupert Murdoch's News Corporation for $5 million when Murdoch backed out of a merger in 1997 between Murdoch's ASkyB satellite service and Ergen's company. Ergen eventually forced News Corporation to turn over satellite assets after alleging misconduct by Murdoch regarding the planned merger. That year probably marked the beginning of Ergen's long-standing public feud with Murdoch. Ergen, the onetime professional gambler, was often described by friend and foe as unpredictable, wily, mercenary, renegade, daring, dueling, combative, ironfisted, or scrappy. Known to everyone as "Charlie," he earned a reputation as a fierce and respected competitor. He was also accused of pennypinching—requiring employees to double up in hotel rooms and take cheap airplane flights in order to save company money. (He followed those cost-saving rules himself.) 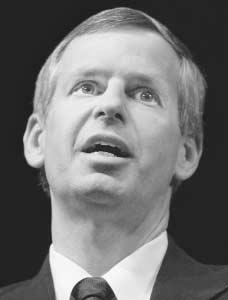 Ergen's passion for winning was once noted by Jimmy Schaeffler, chairman of a media and technology research firm: "If people won't deal with him at the table one on one, they'll deal with him in front of their shareholders or in the courtroom" ( Time, August 20, 2001). The employees of EchoStar often called Ergen "Elvis"—but never to his face—to describe how he could sway his audience to his way of thinking. Ergen frequently starred in his own TV show Charlie Chat , which consisted of infomercials and calls from DISH Network subscribers. On one occasion Ergen made a heartfelt pitch for pay-per-view movies, then quickly changed the subject to offer a free trip to Ireland and free installation for equipment upgrades, and then switched the subject again to express his staunch views on a particular matter of federal legislation. To top it off, Ergen described his feud with the owner of a small group of television stations who had forced him to drop two stations from his network, and then he suggested that his viewers call the station owner to complain about it. For two decades Ergen forcibly battled with larger and more powerful rivals. Using junk bonds, cut-rate prices, and outrageous decisions, Ergen often triumphed over such media giants as John Malone (Liberty Media Corporation) and Rupert Murdoch (News Corporation). One of Ergen's favorite tactics over the years was to give away satellite dishes and receivers to customers who agreed to long-term contracts. He once gave away free dishes to the entire town of Boulder, Colorado, to lure customers away from a competitor. In the early 2000s Ergen clashed frequently with Rupert Murdoch, whose News Corporation was trying to buy Direc-TV from General Motors' Hughes Electronic Corporation. Although Ergen himself attempted several times to put together a group of investors to buy DirecTV, Murdoch outmaneuvered him. Ergen, however, continued to place obstacles in the way of Murdoch's GM deal. While all that was going on, the management of DirecTV became so distracted with the onagain, off-again negotiations that its operations suffered and Ergen was able to pick up large pieces of its market share. Although Ergen ultimately lost DirecTV to Murdoch in 2002, he maneuvered through some of the roughest power plays ever seen in the media industry. In 1988 Ergen received the Star Award of the Home Satellite TV Association, and in June 1991 INC. magazine named him Master Entrepreneur of the Year for the Rocky Mountain region. In 2000 Aviation Week named him Space Industry Business Man of the Year, and in 2001 he was the Frost & Sullivan CEO of the Year for the Satellite Industry. Ergen, a cofounder of the Satellite Broadcasting Communications Association, helped gather support for the passage of the Satellite Home Viewer Improvement Act of 1999, which permitted satellite broadcast of local TV channels. He also testified often before the U.S. Congress regarding TV competition issues. In his off hours, Ergen climbed mountains, played poker, and played basketball. Under Ergen's direction EchoStar was the first company to sell a satellite receiver for less than $200 and the first to develop a UHF (ultrahigh frequency) remote control. Other EchoStar innovations included a nationwide installation network dedicated solely to satellite TV systems and satellite receivers with built-in video recorders. See also entry on EchoStar Communications Corporation in International Directory of Company Histories . Heary, Donald F., Cutthroat Teammates: Achieving Effective Teamwork among Professionals, Homewood, Ill.: Dow Jones-Irwin, 1989.